God strengthens our souls also through the Sacrament of Confirmation. Even though Jesus’ disciples received grace before his Resurrection, on Pentecost the Holy Spirit came to strengthen them with new graces for the difficult work ahead. Then they went out and preached the Gospel fearlessly and carried out the mission Christ had given them. Later, they laid hands on others to strengthen them as well (Acts 8:14-17). Through Confirmation you too are strengthened to meet the spiritual challenges in your life. The Sacrament of Confirmation completes our Baptismal graces, and fully initiates us into the discipleship of Christ and His Church. Our hope is that sacramental formation within our Parish will prepare our youth to receive all the graces the Holy Spirit wants to give them. 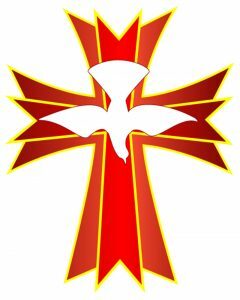 Confirmation: At All Saints Parish, Preparatory classes and other projects begin in the spring of the junior year of high school, with the celebration of the Sacrament in the fall of the senior year. Prior participation in the Religious Education Program is necessary before preparation for Confirmation begins. The class years just prior to Confirmation are important years of formation. During this time, concentration is focused on understanding a Catholic life style, sifting through the decision-making skills and situations unique to this lifestyle, and completing a required number of hours of service aimed at this goal. Contact the Religious Education Office at 361-5252 for more information. Adult Confirmation involves individual consultation, and preparation for celebrating this sacrament through RCIA (Rite of Christian Initiation for Adults). The Sacrament of Confirmation for adults is celebrated at the Easter Vigil. Contact the Religious Education Office at 361-5252 for more information. More information about Confirmation can be found in the Catechism of the Catholic Church (1285-1321).